A new tablet is out in Japan today by NEC. It features an optical drive along with a wireless keyboard and mouse. 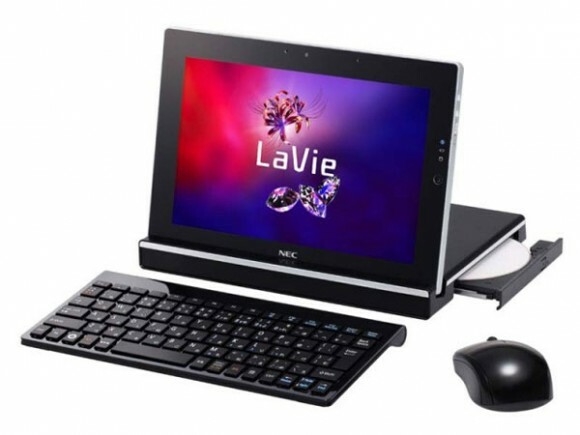 It runs Windows 7 Home Premium and is called the LaVie Touch and makes life simpler for both business and home users. It offers some excellent hardware which includes a Multistation that has a slot for landscape mode. This can be used for the optical drive inside. With this Multistation you get a wireless mouse and keyboard. They are not your typical pieces of equipment. This tablet comes with some great hardware but is quite pricy at $1230 US. It offers excellent battery life promising 10.6 hours. LaVie Touch comes with a 10.1 inch IPS LCD screen with a resolution of 1280X 800. With an Atom Z670 at 1.5GHz processor it runs fast and has the Intel SM35 Express chipset. Additional features include 2GB of Ram, 64GB SSD, WiFi and Bluetooth with USB ports, HDMI out, and a SDHC card slot. Samsung Galaxy Note Launch Date In Europe Soon!! !